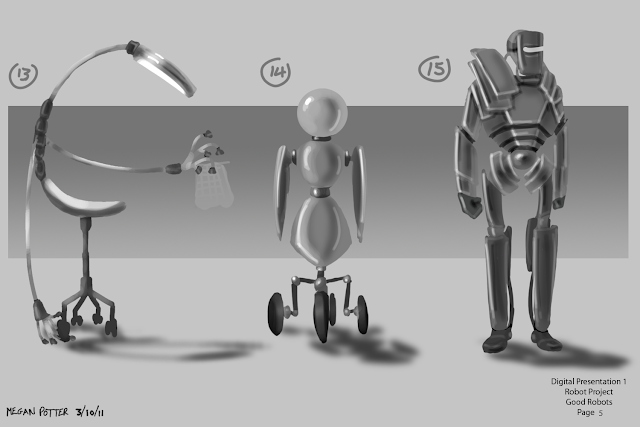 When we started this module, we were asked to draw 5minute thumbnails of robots in order to quickly generate a multitude of ideas from which our chosen robot designs would emerge. I opted to do silhouettes for this stage, which I then roughly worked into so I could build a basic picture of the robot's design, it took around 15 minutes per robot but I felt that this approach was worth the extra time; and I chose to present them in groups of 3 as it breaks down the choices (for the client to choose from) into bite size chunks so as not to be overwhelming. 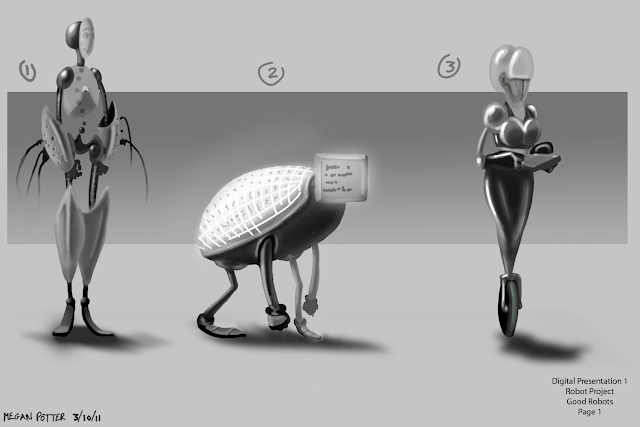 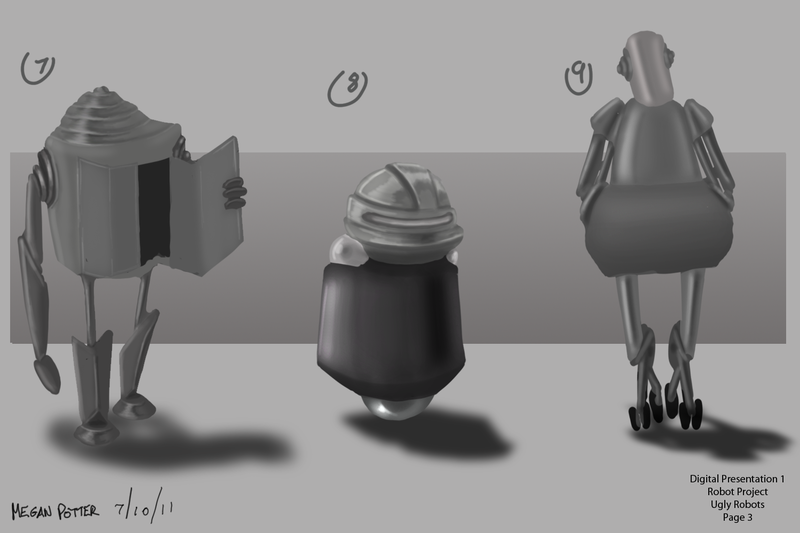 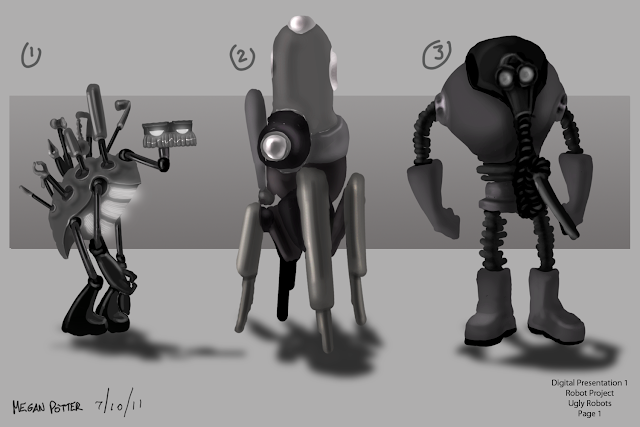 When approaching the good robots, I imagined them to be aids to the humans who would be performing the main duties of the place, so I designed them to process and relay information between the humans and to computers (for example 1 has holes in his forearms so that jacks could be inserted and it could communicate with machinery) as well as possibly taking on more servant roles (such as 3 and 13). 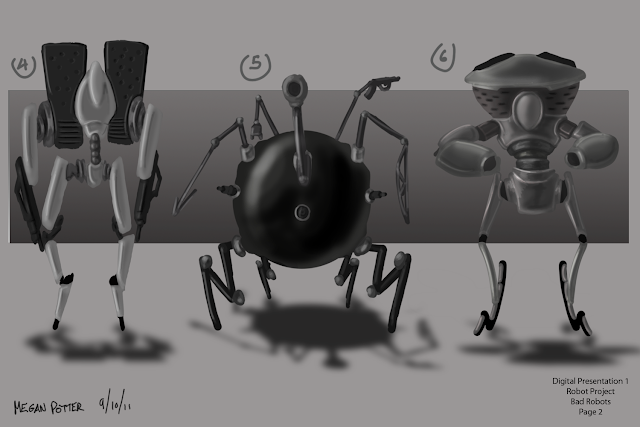 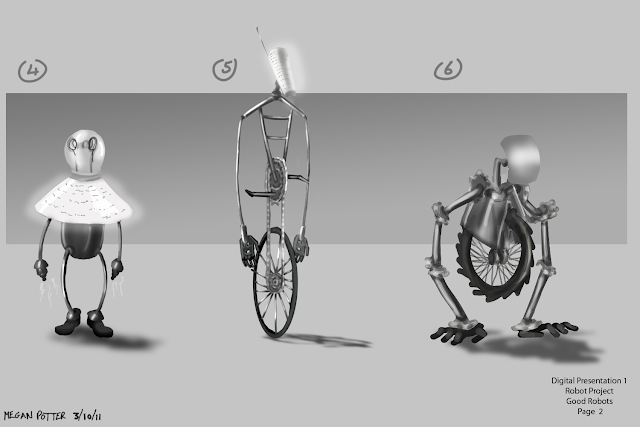 Though there are a few duds and category confusions among my designs, I am generally happy with the variety I managed to create, particularly with the subtle limitations involved with creating a good robot. My favourites are 1, 12, 16, and 18; but when choosing the robot I wanted to have as my Good Robot it came down to 1 and 12. Robot 12 came out on top because I feel that it has a much more fun and iconic design than 1. With the bad robots there was a lot more opportunity to be creative with my designs as these robots didn't necessarily need to be humanlike. 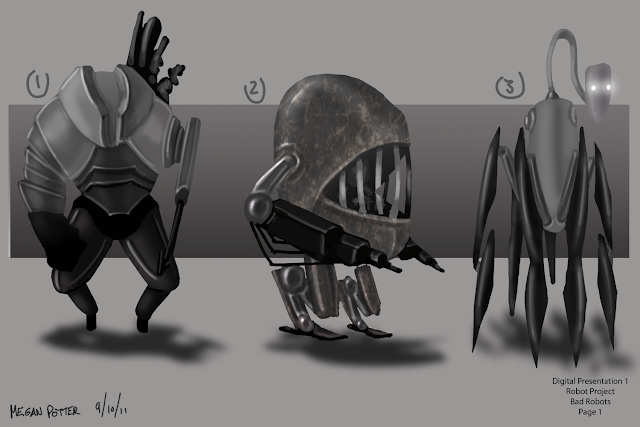 In general I am fairly pleased with my designs, particularly the ones that I have used textures on, but upon reflection I think I should've made these robots more angular in shape and included more gun type weapons rather than claws etc. 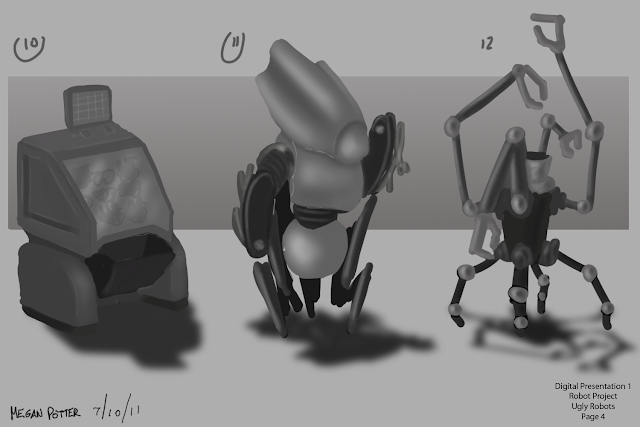 My favourites from this category are 2, 16, and 18; I chose 18 as my Bad Robot because it fits well with my Good and Ugly robots and I have many ideas for refinement with this design. 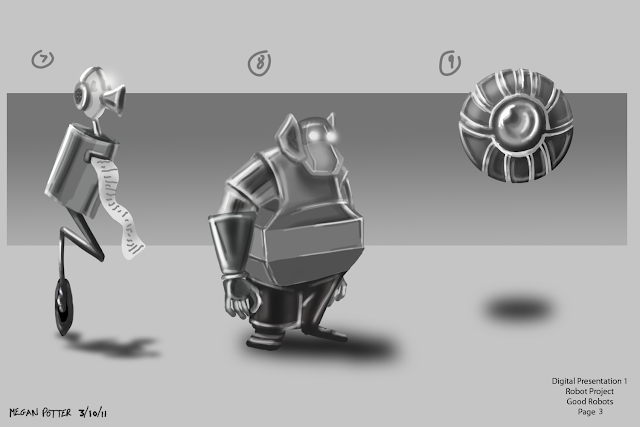 When it came to doing the ugly robot designs I was extremely confident with my first idea (robot 1), so I was fairly uninspired with the rest of the designs. With these robots I imagined them as either maintenance, odd jobs, or cleaning robots. 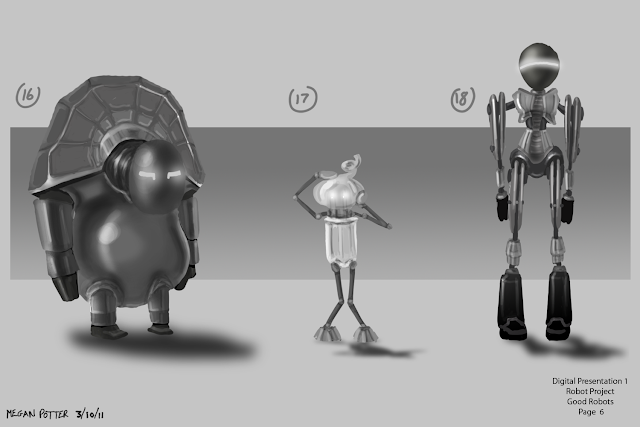 My favourites among this category are 1, 5, 7, and 13 but by the time I finished these designs I was set on robot 1 as my chosen robot. 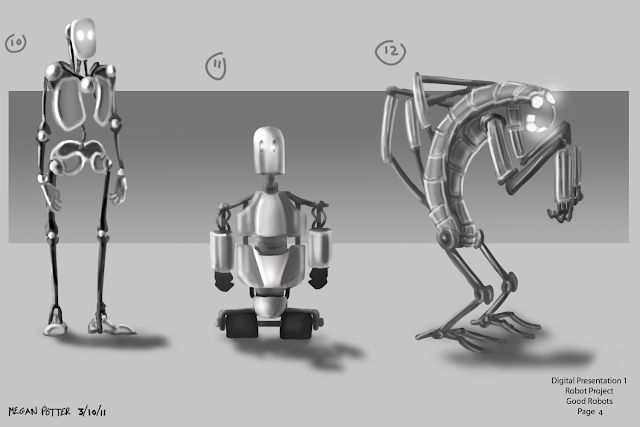 I feel that robot 1 displays its purpose clearly and swiftly whilst still having a bit of character- I was working on a riff of the rundown maintenance guy when designing this robot- and it also matches my Good and Bad robots. 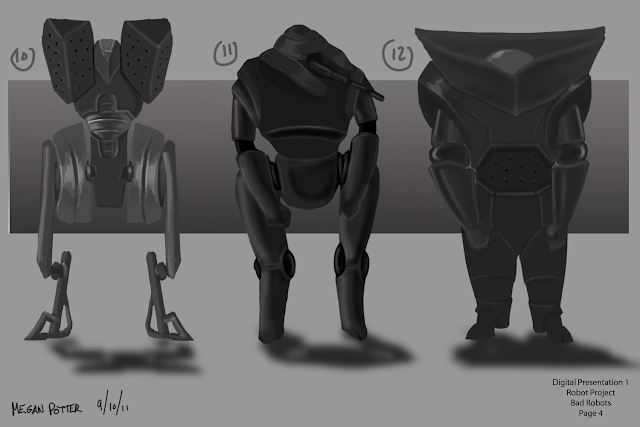 Once I had chosen my 3 robots, I put them onto a height chart (in fact I experimented with 2 different style height charts) in order to compare their sizes and see how they work as a set since they are supposed to be part of the same world. 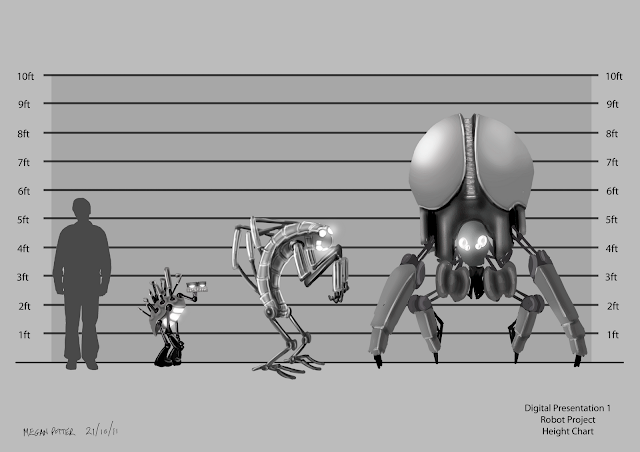 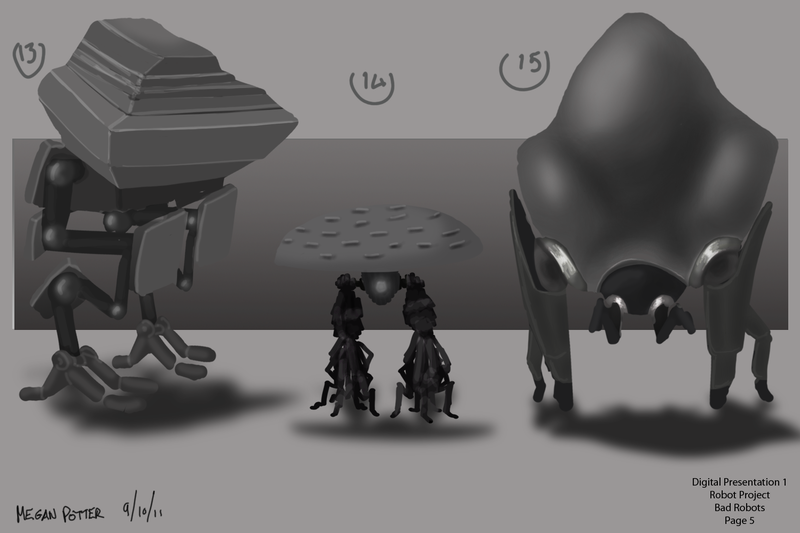 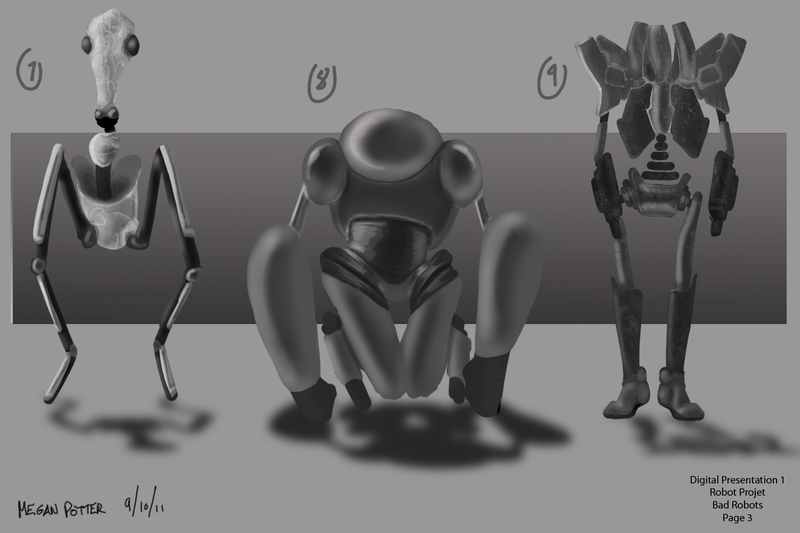 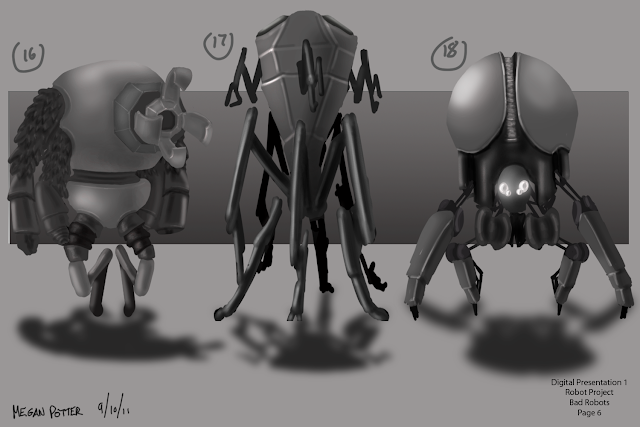 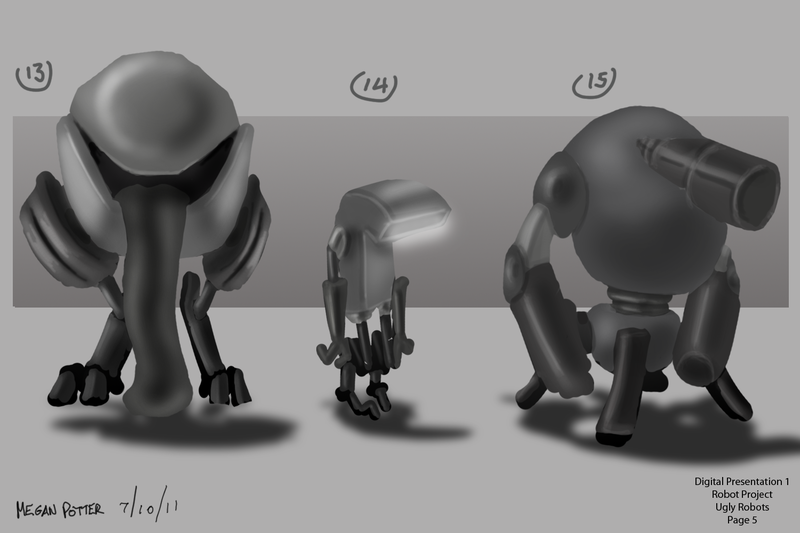 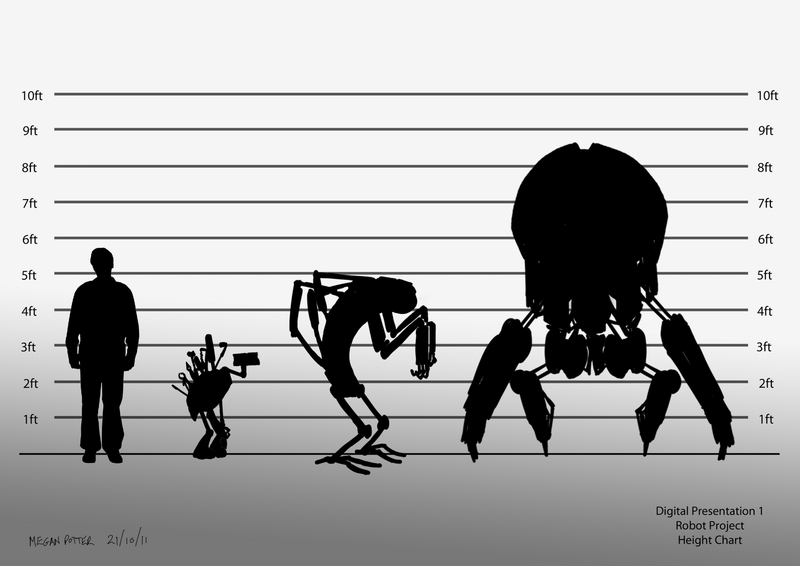 When I have made frontal images of my 3 robots (their refined versions) I will do another height chart. 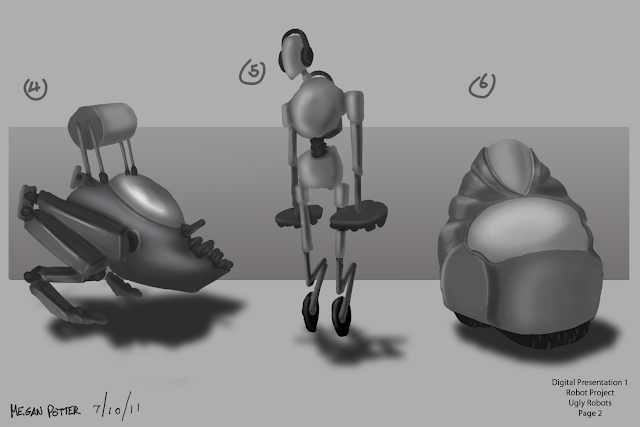 From here, I plan to study robotic joints and then refine my designs to look more functional and to look more like a set.